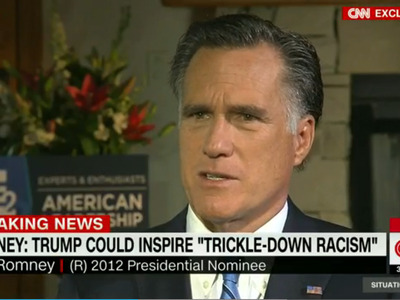 Mitt Romney said that Donald Trump’s election could lead to what he called “trickle-down racism” spreading across the country. 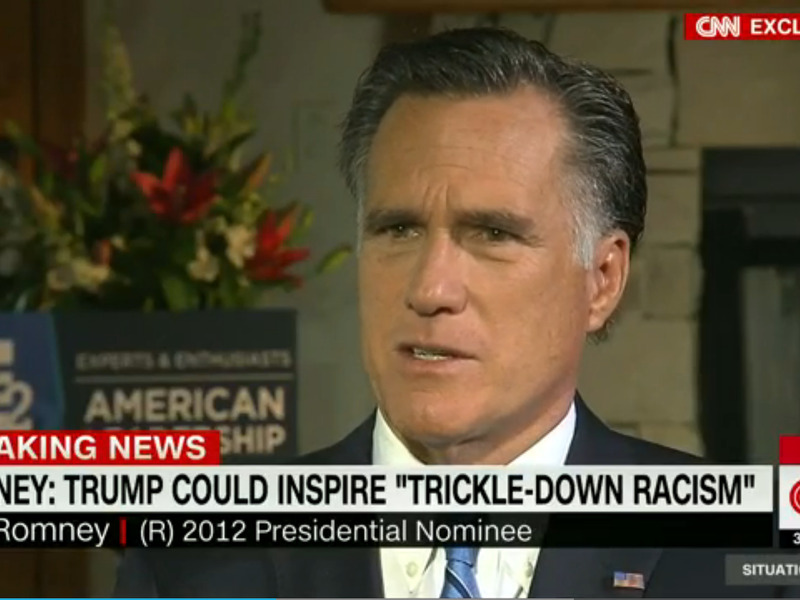 “I don’t want to see trickle-down racism” Romney said in an interview with CNN’s Wolf Blitzer. “Presidents have an impact on the nature of our nation, and trickle-down racism, trickle-down bigotry, trickle-down misogyny, all these things are extraordinarily dangerous to the heart and character of America,” he added. Trump has come under fire for his racially charged attacks on US District Judge Gonzalo Curiel, who is presiding over a lawsuit against Trump’s real-estate school Trump University. Several high-profile Republicans, including House Speaker Paul Ryan and Senate Majority Leader Mitch McConnell have distanced themselves from the attacks, although both have publicly affirmed their support of the presumptive Republican nominee. The architects of the Republican national-security agenda have also pushed back against Trump’s proposed ban on Muslims entering the United States. Romney has been an outspoken critic of Trump, and attempted to recruit a third-party candidate to mount an independent run against the business mogul. Romney himself was floated as a possible candidate for the anti-Trump movement, although he ruled that out during the interview.